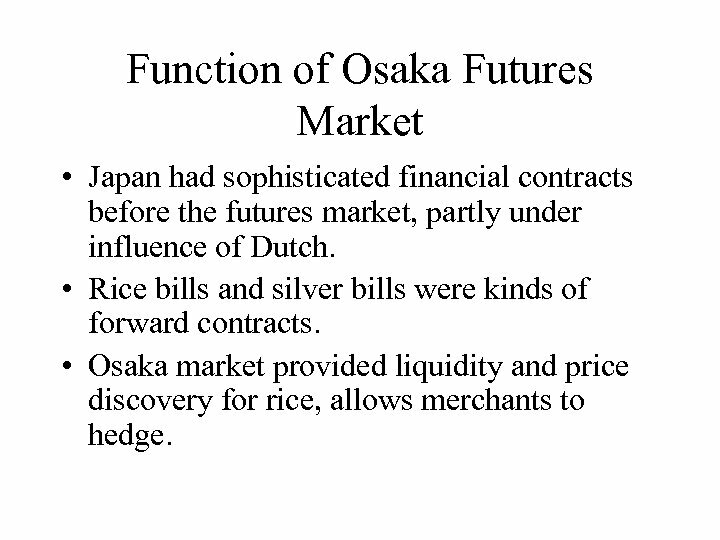 Function of Osaka Futures Market • Japan had sophisticated financial contracts before the futures market, partly under influence of Dutch. • Rice bills and silver bills were kinds of forward contracts. 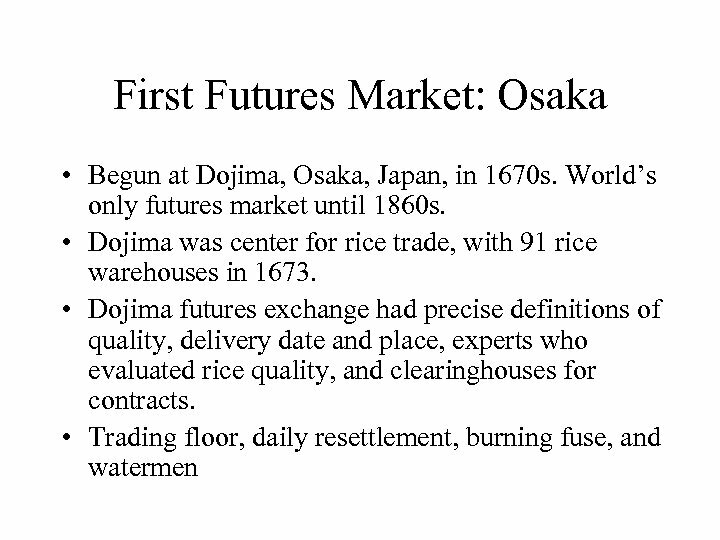 • Osaka market provided liquidity and price discovery for rice, allows merchants to hedge. 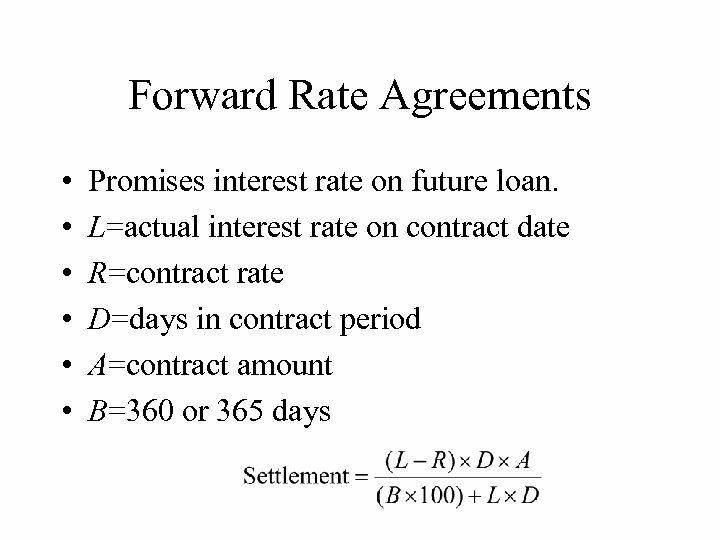 Forward Contract • Forward is just a contract to deliver at a future date (exercise date or maturity date) at a specified exercise price. 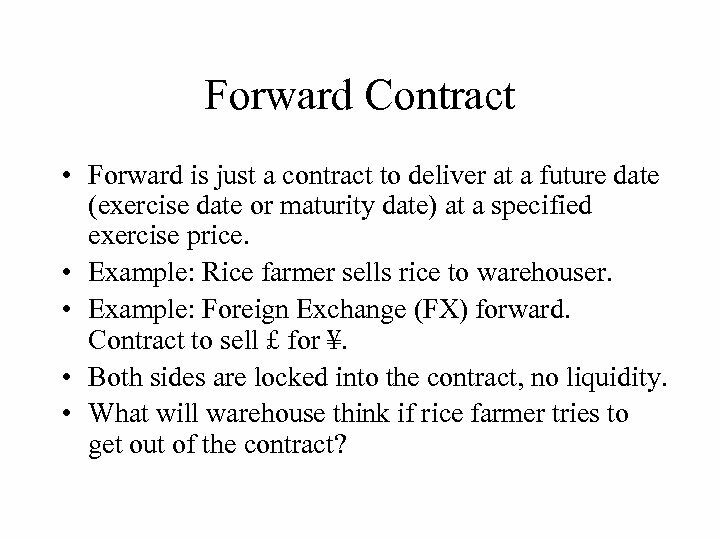 • Example: Rice farmer sells rice to warehouser. 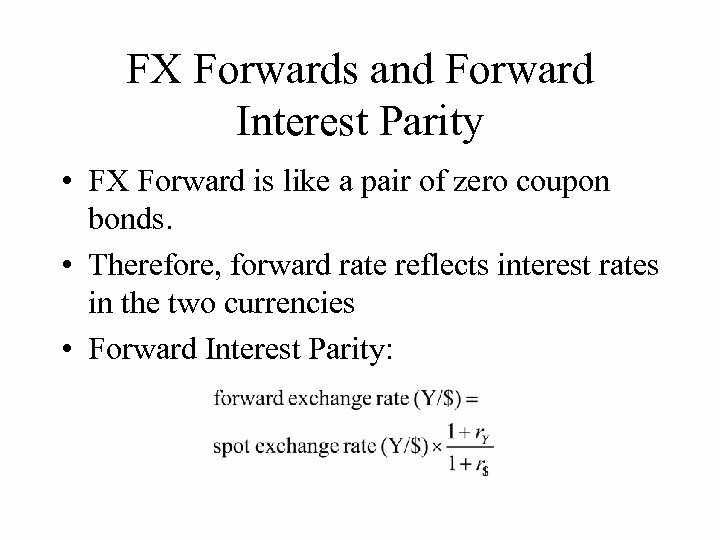 • Example: Foreign Exchange (FX) forward. Contract to sell £ for ¥. • Both sides are locked into the contract, no liquidity. 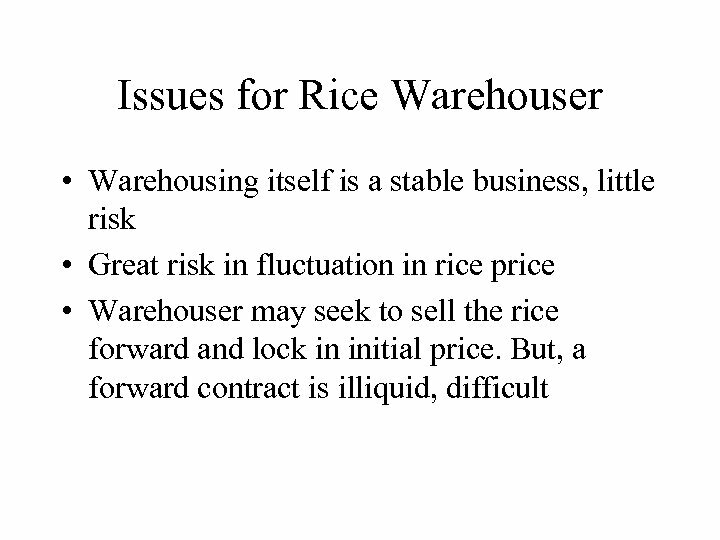 • What will warehouse think if rice farmer tries to get out of the contract? 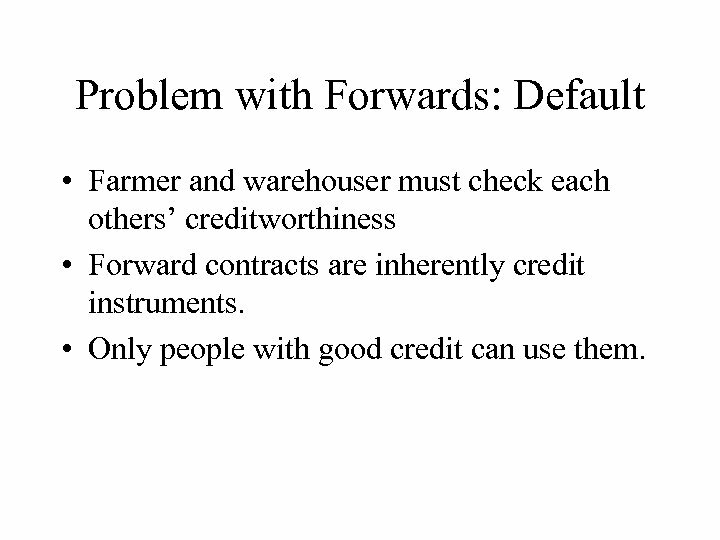 Problem with Forwards: Default • Farmer and warehouser must check each others’ creditworthiness • Forward contracts are inherently credit instruments. • Only people with good credit can use them. 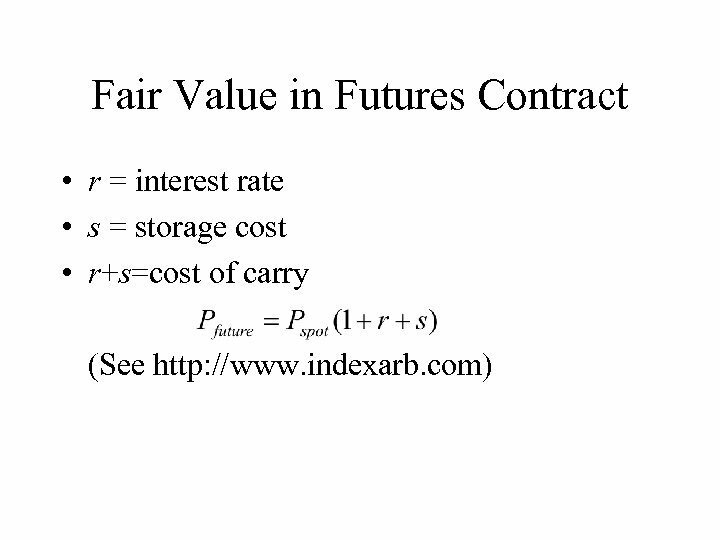 Futures Contracts • Futures contracts differ from forward contracts in that contractors deal with an exchange rather than each other, and thus do not need to assess each others’ credit. 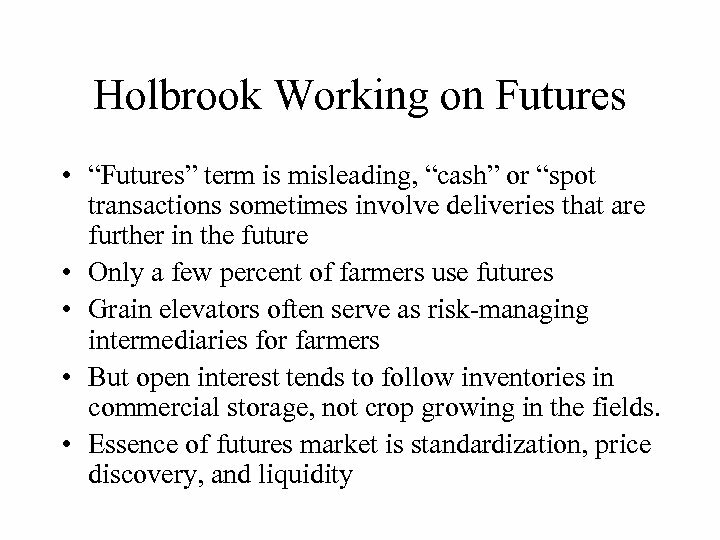 • Futures contracts are standardized retail products, rather than custom products. 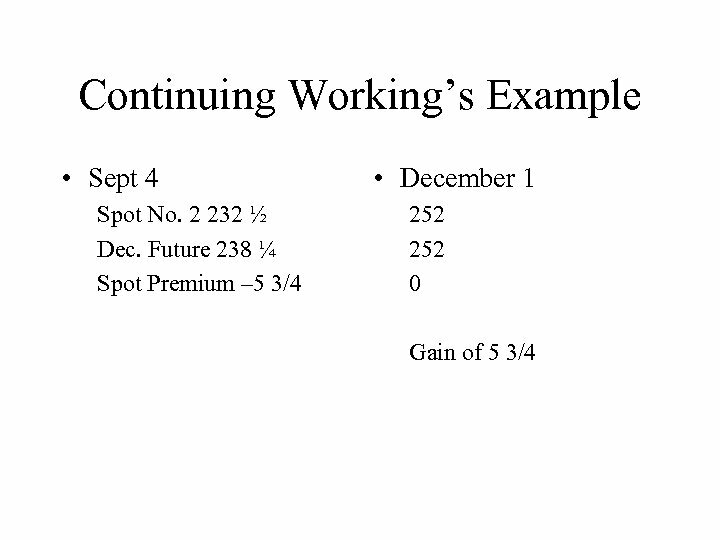 • Futures contracts rely on margin calls to guarantee performance. 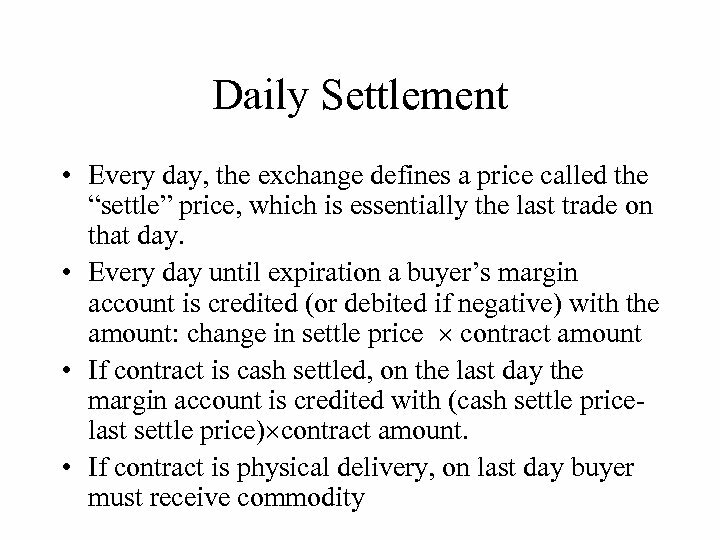 Buying or Selling Futures • When one “buys” a futures contract, one agrees with the exchange to a daily settlement procedure that is only loosely analogous to buying the commodity. 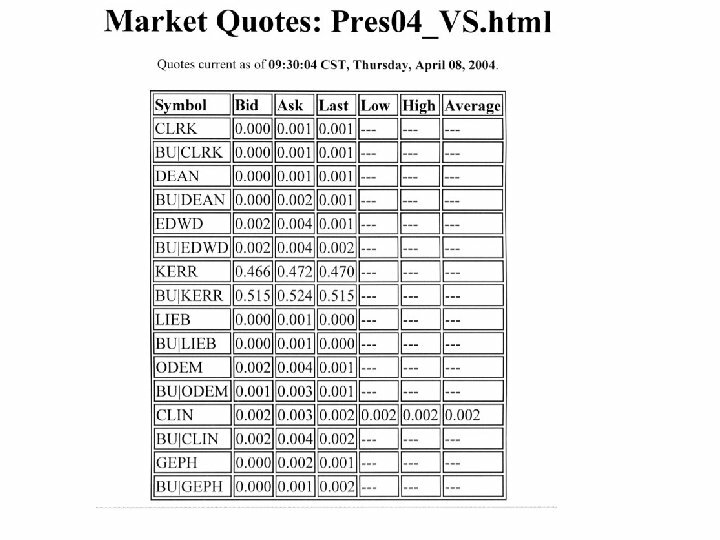 One must post initial margin with the futures commission merchant. 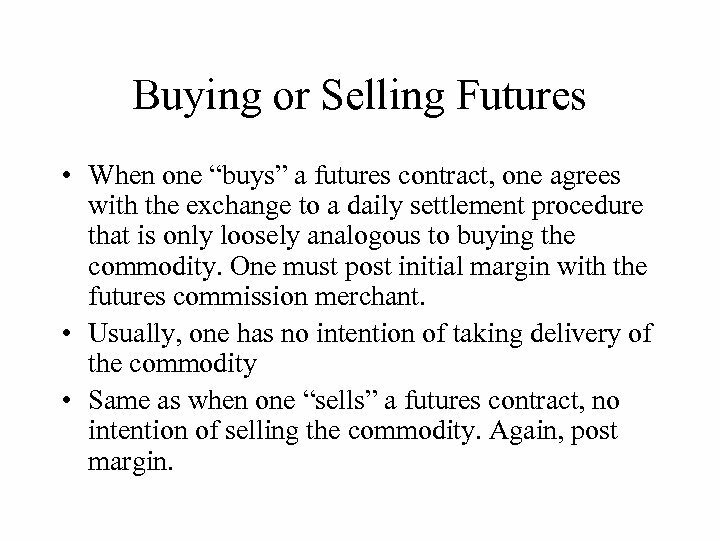 • Usually, one has no intention of taking delivery of the commodity • Same as when one “sells” a futures contract, no intention of selling the commodity. 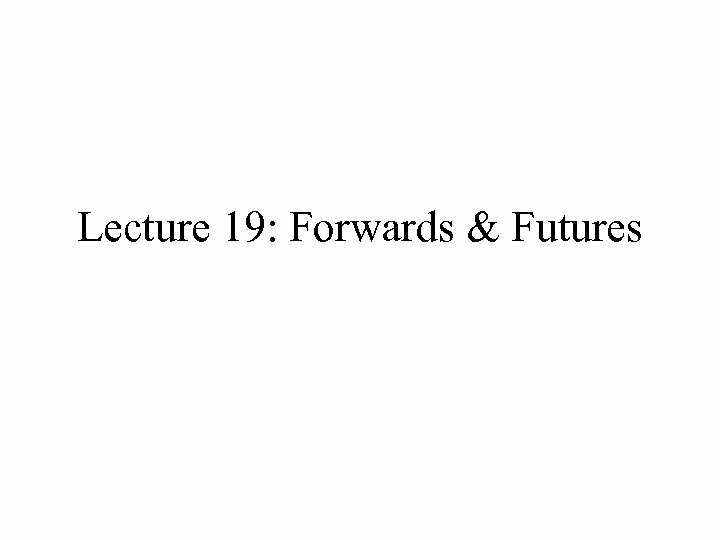 Again, post margin. 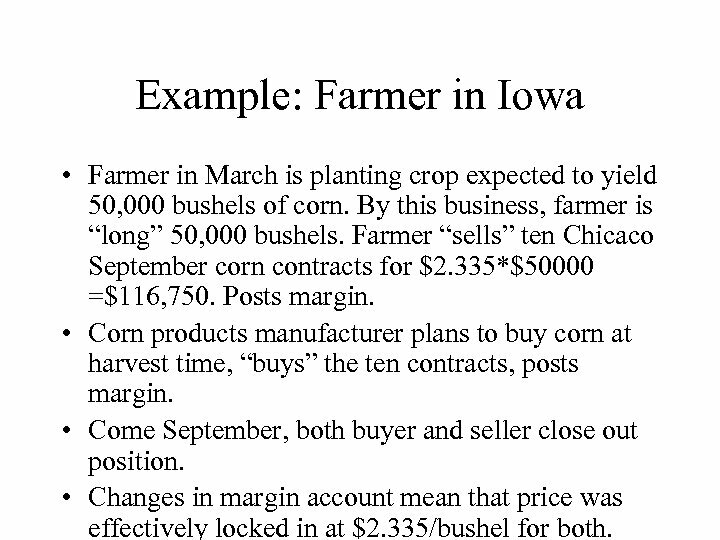 Example: Farmer in Iowa • Farmer in March is planting crop expected to yield 50, 000 bushels of corn. 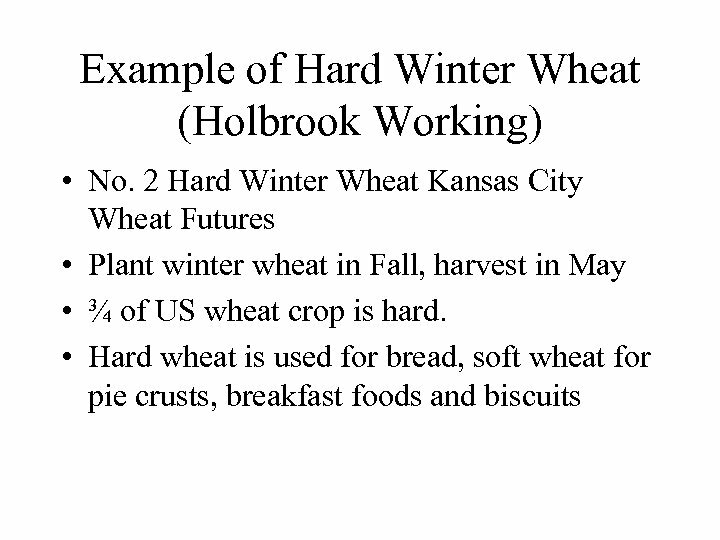 By this business, farmer is “long” 50, 000 bushels. 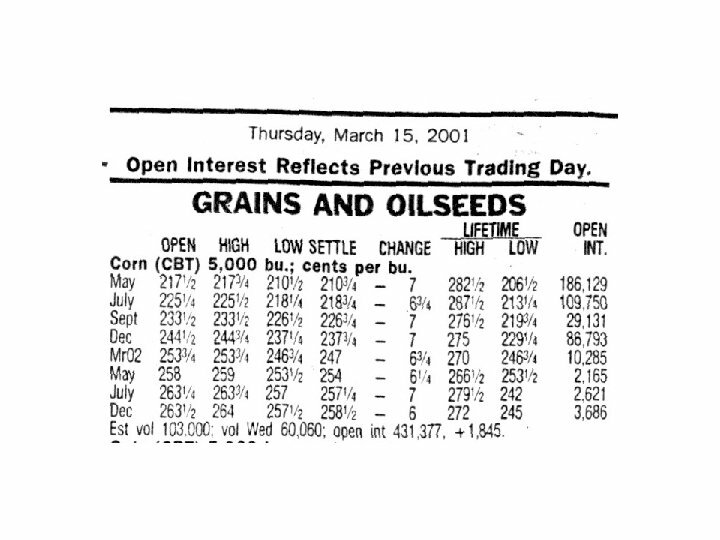 Farmer “sells” ten Chicaco September corn contracts for $2. 335*$50000 =$116, 750. Posts margin. 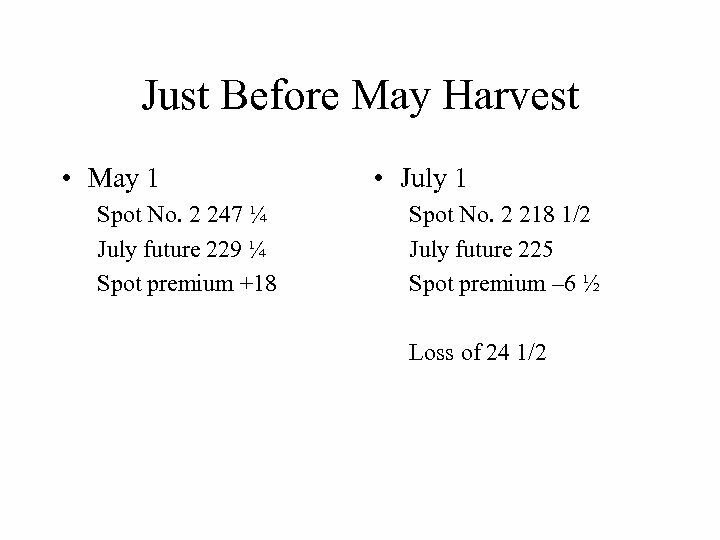 • Corn products manufacturer plans to buy corn at harvest time, “buys” the ten contracts, posts margin. • Come September, both buyer and seller close out position. 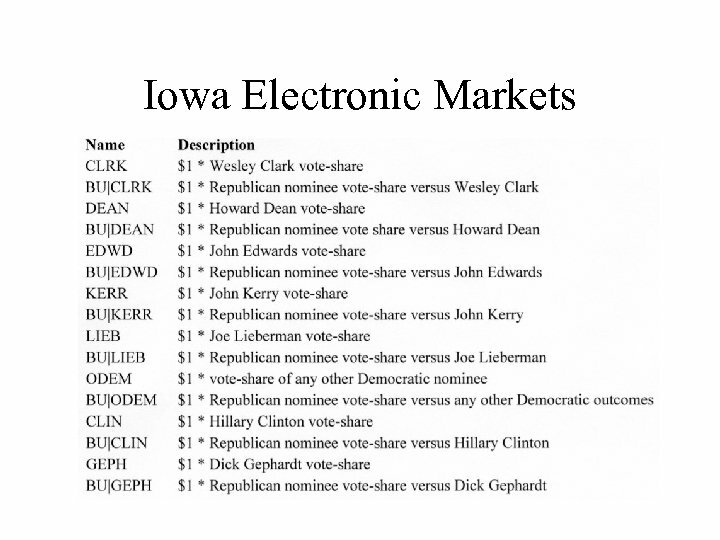 • Changes in margin account mean that price was effectively locked in at $2. 335/bushel for both. 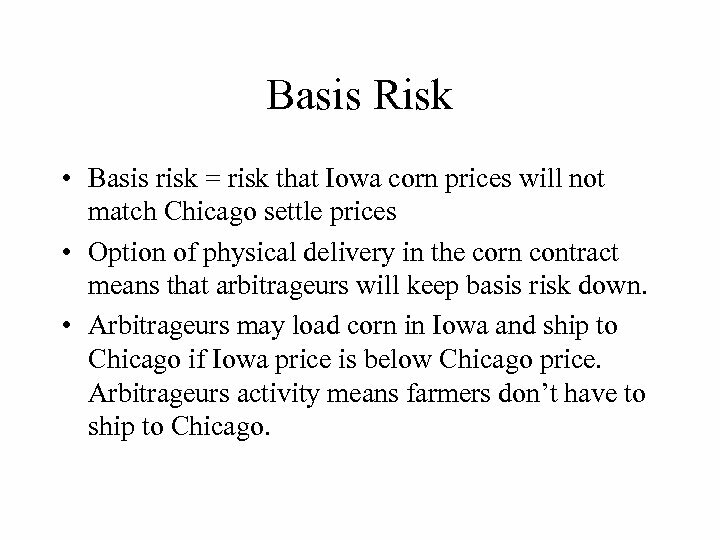 Basis Risk • Basis risk = risk that Iowa corn prices will not match Chicago settle prices • Option of physical delivery in the corn contract means that arbitrageurs will keep basis risk down. 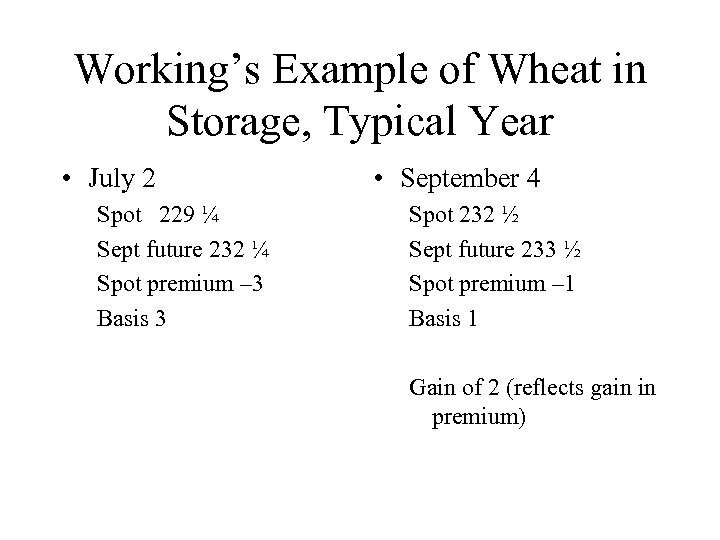 • Arbitrageurs may load corn in Iowa and ship to Chicago if Iowa price is below Chicago price. 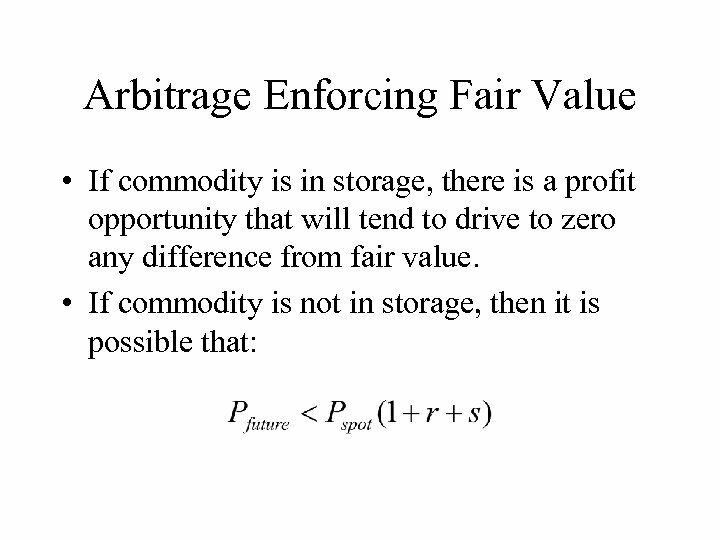 Arbitrageurs activity means farmers don’t have to ship to Chicago. 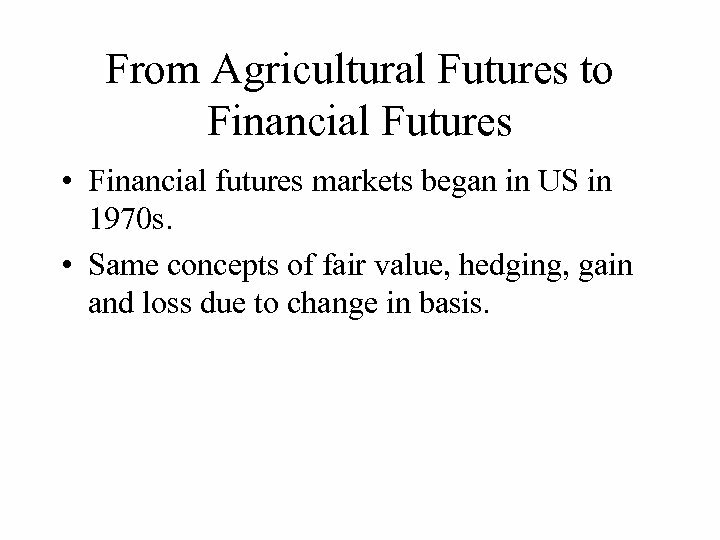 From Agricultural Futures to Financial Futures • Financial futures markets began in US in 1970 s. • Same concepts of fair value, hedging, gain and loss due to change in basis.